I fished Belton today from before sunup until after the impact of the mild coldfront that hit this afternoon impacted the fish negatively (~4:45p). Today was a classic illustration of how significantly the weather impacts the behavior and location of white bass. From sunrise to 9:09am I fished Area 574 and caught a total of 8 fish, two of which were short largemouth, and one of which was a short hybrid (the only hybrid caught all day today). During this time the skies were bright and clear and the winds were calm. More fish were in this area, but they were just shut down. As I hooked the several white bass that I did catch here, I could see 10 to 15 other fish just barely rise up off bottom to give chase, but then they’d just drift back to bottom and stay there. From 9:09 to 11:15am, the skies began to cloud over, but the winds were still calm. In the vicinity of Area 575 (BA: 8T), I jigged (3/8 oz. TNT 180) for about 2 hours and brought in an additional 26 fish, all decent, keeper white bass. From 11:15 to 3:05pm we enjoyed both grey cloud cover and a light W. breeze. During this time the fish activity increased dramatically. In the vicinity triangulated by Areas 575, 576, and 577 (BA: 30T), I continued jigging and occasionally tossed a blade (Reefrunner Cicada), and put an additional 54 fish (53 whites and a ~2 lbs. blue cat). At exactly 3:05p, the winds very suddenly increased to ~17mph and changed directions to NW. Over the next 15 minutes the fish went on an absolute feeding binge and then very quickly shut off. I landed 18 fish in this very short time span, all off bottom at Area 578 (BA: 13T). I noted that all suspended fish I saw at this time refused to strike or give chase to my slab. Once the fish shut down here, I moved to deeper water to see if the “insulating factor” of deepwater would work in our favor. I hit Area 579 and fished in 32 to 37 feet finding fish both on bottom and suspended. I landed 11 fish over the next 60 minutes, about 2/3 came off bottom and 1/3 came from suspended groups of 3-4 fish each. Only about 1 in 4 of the groups of suspended fish would respond to my retrieve. I fished “Installment #2” with Uncle Greg C. of Virginia today — this time along with his youngest nephew, Luke, of Kempner. Luke is 6 years old. Greg and I took into consideration yesterday’s fish patterns, today’s weather forecast and Luke’s abilities, and agreed a shortened trip, simplified with live bait, would be the best bet at helping Luke have the experience at landing some fish. Greg helps Luke show the best of the bunch today. Yes, those are ice pellets on Greg’s hood and shoulder!! Said Luke, “Only wimps stop fishing when it’s sleeting!”. Air Temp: 35F at trip’s start. Wind: Flat calm until ~10:20a when an ESE ripple began and continued the remainder of the trip and beyone. Skies: Grey, heavy cloud cover dropping frozen precipitation through 10am, changing to a light rain thereafter. Environmental Note: Shad netted in 5.5 feet at Area 573 after scratching at 317 and 318. We launched at 7:15a and waited to see if the forthcoming weather change was going to change the fish and game activity which, since last Wednesday’s cold front, has consisted of a brief morning feed lasting only about 90 minutes beginning at sunrise. We didn’t have to wait long to figure this out — a few birds showed up at the appointed time and promptly departed after finding no fish to feed over. We fished live shad on downlines over this entire area with nothing happening. We lost one fish that struck a slab fished lift-drop style as I tried handing the rod over to Luke. We, too, left the vicinity of Area 093 and made a quick flatline trolling pass off of Area 999 after seeing a few terns working, but scratched there and so headed out to do things the hard way — searching out deepwater fish with sonar. Fortunately, I spotted fish at the very first place we searched at the base of a breakline from 27 to 31 feet in the vicinity of Area 571 (BA: 3T). We baited up 3 rods with 2.75 to 3.5 inch gizzard shad fished on downlines. No sooner had we set the third line than the first two rods were going down. We quickly boated 11 fish in a brief flurry of activity, and missed several additional fish due primarily to the bait size being on the large side for these 11 to 13 inch fish. We stayed in this general area and to the NW of it by about 120 feet right up until 10am. During that time we landed 6 more whites, lost one more at boatside, and had several more lost on the hookset. As the downlines worked their magic, I cast a slab and worked it lift-drop style trying to pick up a few bonus fish. I hooked only one and we lost that one as I tried to hand the rod off to Luke so he could try his hand at using spinning gear. At 10:10, with the temperature still in the mid-30’s, sleet falling, and Luke’s clothing growing increasingly damp, Uncle Greg and I decided we’d better call it a day. We took some good photos to capture the memories and headed in to the dock. After safely delivering the boys back to the minivan, I was about to load the boat on the trailer and call it a day when I observed that the first wind of the day had just begun — a slight ripple out of the ESE. At this same time, the sleet changed to light rain. 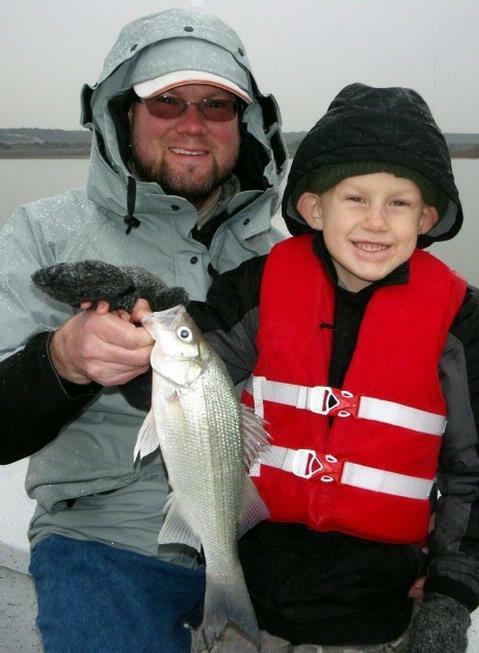 We now finally had the makings of some “white bass weather” — grey skies and a semi-favorable wind. I headed back out and looked over a number of areas seeing little, but finally located a mass of fish — both white bass and threadfin shad, holding on and just above bottom in 35 to 38 feet of water at Area 572. I dropped 2 downlines down with live shad and left those rods alone while I worked a slab (TNT 180 in 3/8 oz.) while watching sonar. Finally, after 6 days, the fish turned on. From 11:10a to 2:02pm I boated 91 white bass and 1 largemouth, all from an area about 60 feet in diameter. Despite having live shad down amongst these fish the entire time, I caught only 1 of these 92 fish on a live shad. The size of the bait was much larger than the size of the forage these fish were encountering, and they just flat refused to give it a look. My slab, on the other hand, was a dead-ringer for the forage (I know this because I compared it to several regurgitated meals that were coughed up on my front deck). This was very basic, simple slabbing. I did intentionally pause the bait on the fall and the fish hit very noticeably. There were no birds of any sort responding to these fish. I fished “Installment #1” of 2 trips planned by Greg C. of Virginia for his 3 nephews, Matthew, Mark, and Luke, all of Kempner, TX. Today, Uncle Greg brought his older two nephews, Matthew and Mark. Mark with our best white bass of the trip — a nice 14 incher. Read the story below for the whole story on this oddity!! Air Temp: 31F at trip’s start; ice froze in guides for first 40 minutes of fishing. Wind: Calm until ~10:20a when a NNE ripple began and continued the remainder of the trip and beyond. Skies: Continued clear, bright, post-frontal condition (5th day of such conditions). As has been the case for a while now, under clear, bright, windless conditions, the white bass have been doing all of their feeding in the first 90 to 120 minutes of daylight and really shutting down hard after that. I coached all 3 anglers on the necessary jigging techniques they’d need to use once the fish began to feed so we could take advantage of every last opportunity that presented itself before the trail went cold. Today’s weather forecast called for little or no wind, so I knew it’d be tough going after the sunrise feed. We began our day between Area 93 and 117 (BA: 6HG, 5T) with all four of us jigging with slabs (TNT180’s in 3/8 oz.). As the light level rose, the fish activity rose with it. We steadily encountered small groups of 3-4 fish holding and feeding very tightly to the bottom. All three guests really got the hang of the jigging technique quickly and by 9:37, we’d boated 25 fish, of which 23 came on slabs with the last two fish hitting on live shad after the fish got too lethargic to be interested in the slabs. Now we faced a tough situation: the fish had stopped biting, the birds had roosted, the water was dead calm, and the skies were bright — the “perfect storm” to put fish down. From that point in the morning until we wrapped up at just after 1:00p, we boated only 2 more fish after spot-hopping in primarily deep water to try to tease up a school of deepwater whites. Mark landed one small white bass out of 38 feet of water at Area 402, and Matthew landed our final fish of the trip on a live bait at Area 117. Uncle Greg had some experience as a mate aboard an East Coast party boat (also known as a head boat). If there’s anybody you want to have aboard on a tough day, it’s an experienced fisherman who knows that tough days do happen — and so it was today. Now, about that photo. As we searched over deep water for fish, Greg and I noticed something white floating in the distance. We thought it was either a fish or a feather. As we got closer, we saw it was a large white bass with a bluegill caught in its mouth. 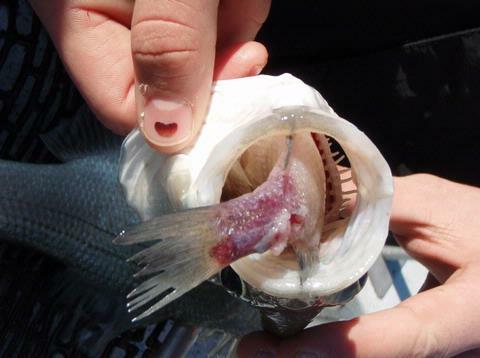 The white bass had attempted the sunfish, but the sunfish wedged in its mouth and couldn’t be swallowed. The white bass evidently grew exhausted and came to the surface. Both fish were still barely alive when we came upon the incident. We removed the bluegill and tossed it out into the water and attempted to revive the white bass, but without success, so, we left it floating on the surface, too. Within minutes a large herring gull came and plucked the bluegill off the surface which was quite entertaining. Not to be outdone by a lowly seagull, a nearby osprey then zeroed in on the white bass and effortlessly snatched that 1.5 pound fish right off the water’s surface and headed gracefully to a nearby perch to feast. That was cool!! For details about the rods, reels, lures, and other gear we use, please click on the “ABOUT” tab near the top of any page on the website, then click on “ABOUT YOUR GUIDE” on the drop-down menu. I fished a half-day morning trip today just to do some experimenting with very deep water fish (45-55 feet) on this day that was forecast to present one of the two toughest sets of winter conditions — that being clear and calm (the other being a wet, NE wind typically generated by cold, low pressure). It’s been my experience that this deep water seems to be an insulator against some of these negative scenarios. Wind: Winds were at just barely a puff from the W the entire morning. Skies: Bright, clear, post-frontal blue skies today. I got on the water at 7:15 and did a bit of searching with sonar with downriggers down, but had no takers on that fast moving presentation. By 7:30 I found some fish tight to bottom on a bit of a break near Area 093 and worked a slab in a jigging presentation for 3 nice white bass. As the sun cleared the horizon, I moved on to Area 117 (BA: 7HG, 7T) and, over about 40 minutes, picked up 7 more nice white bass. These fish were very reluctant to move upward in the water column for a bait, however, they also would strike multiple times in short order. Things quieted down here very quickly. I now headed for deep water to do some “tough-condition” experimenting. I hit Area 567 (raised a large school of fish and left due to other anglers too close), Area 569 (BA: 3T, 4 fish), Area 568 (BA: 4T, 10 fish), Area 407 (BA: 3T, 2 fish), and Area 570 (BA, 2T, 3 fish) and found white bass at all of these locations ranging from 38 to 53 feet deep. At all of these areas I could see just one, perhaps two clear arches showing on or just off bottom with sonar, but, once I got a slab down amongst them, they would perk up and a school would seemingly materialize out of nowhere. More often then not, these fish would rise up off bottom as I pulled my slab upward, but would not pursue aggressively enough to take the lure. Most fish I caught were taken on a delayed pause, or were simply “there” when I went to pull up on my jigging stroke. Without fail, hooked fish would always attract schoolmates up off bottom, but, these fish would not turn on, but would instead just settle back to bottom. So, fishing was tough and for just 1-2 fish at a time, but, at least I found them and was catching them when the shallow water bite was shut down hard. I fished a half-day Christmas Eve morning trip with Daniel P. and his fishing buddy, Bobby D., today on Stillhouse. We were targeting white bass and had a fair day going for us until cold front-related winds at 30+ mph forced a premature end to our trip around 10:35am. Before being blown off the water, we managed 25 fish, all on slab spoons fished both lift-drop style and via a traditional jigging motion. Bobby lips the best of our first 19 fish caught on our first stop this morning before gale-force winds blew us off the water. Wind: Winds were light from the WNW at 12 until around 9am, then winds shifted to NNW and the windspeed increased dramatically us to a steady 30 with higher gusts. Skies: We had very light rainfall with 100% grey cloud cover as a cold front made its way into Central Texas today. We got on the water at 7:15 and did a bit of searching with sonar. By 7:34 we’d pinned down some fish with sonar in ~18 feet of water with shad suspended overhead. We got one crappie here and moved toward some bird activity in this same general vicinity (Area 093 BA:7HG, 6T). We boated 19 fish here before moving on. 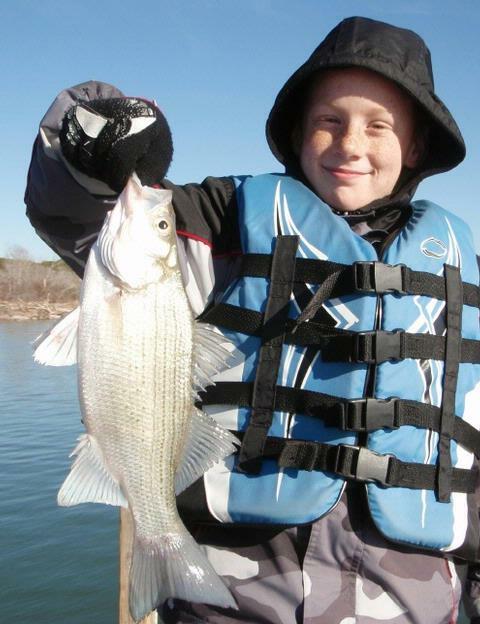 Of these, 17 were white bass, and of these, 15 fish were 11.5 to 14.75 inches – all caught on the 3/8oz. bait. This was a significant size difference over the fish we’ve been catching in deeper waters further down lake. 1 crappie and 1 black bass rounded out the count here. Next we began looking deep for fish. As so often happnens when the fish are relatively inactive, they essentially rest tight to the bottom and are hard to pick up on sonar. You have to trust your instincts on where the fish might be, look for bait in the vicinity, and fish, albeit briefly, to confirm the presence of fish. We made 2 stops without success and then found fish at a third location (Area 566) jigging for just 2 fish small fish here, with 2 more missed. We then moved on to what would be our final stop at Area 567 and jigged for four more fish with 2 more missed. It was at this point that about every 5th wave would lap over the bow due to forming swells. I simply could not hold my guests on the fish that we’d work to find and so we agreed to call it a day at that point. As is my custom, I pro-rated the trip and refunded the balance as these fellows only got to fish for 3 of our planned 5 hours. As it turned out, the temperatures dropped to 36F into the afternoon and then plummeted overnight to 27F on Christmas morning as the cloud cover cleared, the winds settled, and radiational cooling kicked in. I fished a neat group today — Uncle Rodd L. of the Reno, Nevada, area came down to Texas with his son, Nick, to visit, among others, his 3 nephews living in Temple. Uncle Rodd holds camera-shy Merrill’s fish for him as the other boys (L to R) Nick, Josh, and Kris proudly display their hard-won catches from a pretty tough morning on the water. On a whim, Uncle Rodd called me late Sunday afternoon and wanted to get all five on the water the following morning. So, this morning, at 6:39am, a minivan full of expectant anglers arrived on the shores of Stillhouse ready to get after it. The party included Uncle Rodd, his son, Nick, and nephews Josh, Kris, and Merrill, ages 12, 10, and 8. I had planned on their arrival a bit later so as not to get them too cold by getting on the water before the sun rose, so, we stayed in a protected area and worked on their vertical jigging technique while time allowed so they’d know just what to do once the fish began to cooperate. As luck would have it, we landed 2 white bass sitting right there practicing!! As the day got underway, things started off tough and didn’t improve all that much by trip’s end. The day was clear, cool, bright, and nearly windless until around 10am. Windless days are just tough on both Belton and Stillhouse. There were some birds out, but they were patrolling like we were, and rarely dropping down to the surface to actually feed. We hit a number of areas and scratched up a fish or two, but did not encounter schooled fish at any point. At around 10am, very suddenly, a SW wind began to blow. The velocity went from light and variable to SW at 9 in literally 20 seconds. I moved us adjacent to the river channel at Area 401 and just like a light switch, the fish turned on. We jigged for 14 white bass and 2 drum in about 30 minutes. Because we had fairly light slabs and the water was quite deep (nearly 50 feet), the boys were getting more hits than they realized, so we missed some opportunities there, but, that’s part of the learning process. Uncle Rodd and I could see the boys’ rod tips twitch and told the boys to set the hook when we observed that, but often that hint came a bit too late. These fish slowed down fairly quickly, so I then moved us to Area 549 and the surrounding area hoping the wind would be working its magic in much shallower water, too, but that was not to be. After failing to find any action on sonar here, we returned to the vicinity of Area 401 to scratch up anything that remained active in this area. By now, it was getting towards 11:30am, which is traditionally the time the morning feed is wrapping up barring any extremes in weather. We put an additional 5 fish (3 whites and 2 crappie) in the boat, but it was like pulling teeth. By 12:15 we called it a day with 25 fish boated. 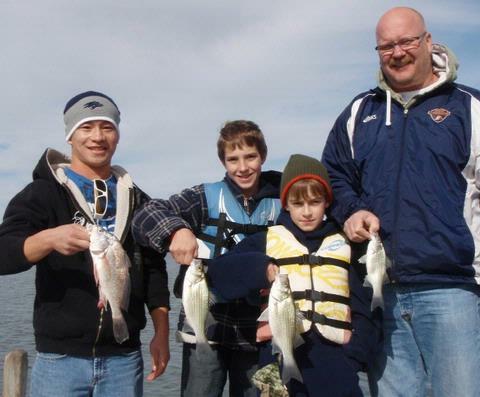 Each of the boys had an opportunity to catch several fish even though the action was slow. Just fished a quick 2 hour trip this morning to see what was going on. It was clear, cold, and calm — poor winter conditions — so I didn’t expect much. Slack winds = slack fish activity and that was the name of the game this morning. Skies: We had fair skies at sunrise and for the majority of the day today. I got out this morning and things were very quiet with little natural sign offering clues to fish location. I fished 4 areas catching just a few reluctant fish at 3 of them. All fish came on the 3/8 oz. TNT 180 (Jeff at Salado Creek Outfitters carries them locally). I hit Area 385 first, and jigged up 2 white bass, but they were stubborn and I just didn’t have that 6th sense feeling that things were going to turn on here. I moved to Area 549 (BA:8T) and jigged for 7 whites in 27 feet here. I moved to Area 558 (BA:3T) and jigged for 5 whites here right on the breakline. Every fish hit an intentionally paused slab with no follows on hooked fish — it was just very slow. 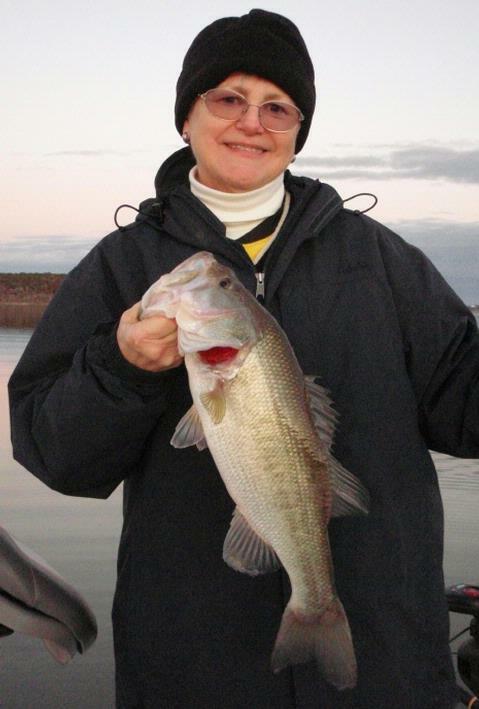 Charlotte with a 4.0 pound largemouth — the largest she’s ever caught in 64 years!! Charlotte with a “spoon-fed” hybrid out of 27 feet. Skies: We had continuous light rainfall until 11:30 with heavy grey skies, then rain tapered to a stop by 1:30, gradually completely clearing by sunset. We covered a lot of ground today in order to get back in touch with what the fish were doing and where they were doing it. We started off looking closely at some bird activity down towards the main lake, but these bird were over 40+ feet of water with no fish arches showing in the vicinity beneath them. Whe found abundant schoolsof suspended shad at 12-15′ beneath the surface in these areas. Occasionally a school would rise to the surface and give the birds a shot at a meal, but these birds were not working over fish, so we left them alone. We moved on to Area 099 and looked over things with the graph. There is a nice break here from 20 to 25+ feet and we found fish up on the top of the break and along the side. We spent a good chunk of our morning trip within 30 yards of our initial buoy drop and boated over 40 fish here. By around 9:30 these fish got sluggish, so we went hunting a new school to work over. At Area 560 we encountered fish at 27.5 feet deep and graphed them out to 34 feet (BA: 15T). I buoyed on the shallow fish, worked them first, then headed deeper as the action up shallow slowed. We added 24 fish to our count of of this area before the school wised up to our tricks. We then moved to Area 561 along an extensive, gentle breakline. We graphed scattered fish for over 90 yards on this area before doubling back and buoying right on top of a fair piece of action. We would catch 4-6 fish in short order as a moving school would come by, then go without catching for a bit, then we’d catch 3-4 more in a flurry, then another dry spell … and so it went up until 11:30a by which time we’d boated 69 fish. 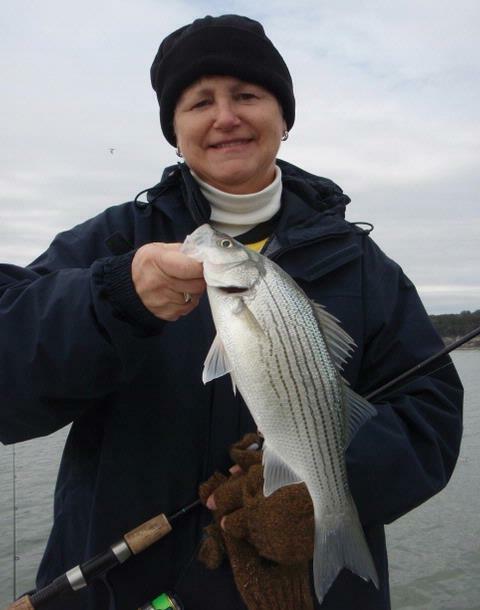 I told my we had to catch 70 so it’d be easy to remember when I went to write this report, but her hands were pretty stiff and cold by then, so, I dropped a downrigger and, in about 5 mintues time we’d hooked up with an 11 inch white bass — fish #70 and our lunch ticket. We took an hour’s break, warmed up, downed some leftovers and then went back after them with renewed vigor. We looked deep initially and caught a drum and crappie and over 40 feet of water doing so, but, sonar revealed very little in the way of bait schools in deeper than 35 feet, so, we revised our approach to look in water no deeper than that. We located fish at Area 562 (BA: 8T) and jigged for 22 fish there. We located fish at Area 563 (BA: 6T) and jigged for 18 fish there. We then encountered a lull in the action from 2:30 to 3:30pm as the skies cleared and wind went slack. Around 3:30pm things picked back up a bit. We located fish at Area 438 and jigged for 12 fish. While here, I got a reliable report by phone from a friend who was catching whites steadily in the vicinity of Area 356. We located fish at Area 564 (BA: 9T) and jigged for 9 fish. We located fish at Area 565 (BA: 4HG, 2T) and jigged for 6 fish. And we ended up at Area 138 (BA: 12HG) and jigged for 3 fish. At these last 5 areas, we left fish while they were still actively feeding so as to try to locate other active fish during that window of feeding activity. I’ve emphasized many times in my blog entries that if you want to locate fish, you have to be willing to leave biting fish at areas your confident in to find fish while they are still in a biting mood. To fish a bite to the bitter end and then expect to move and find more cooperative fish is rarely a possibility. Fish simply don’t feed all the time, and this is especially true in the cold water period we’re now encountering. Today I ran my 14th SKIFF (Soldiers’ Kids Involved in Fishing Fun) trip, sponsored by the Austin Fly Fishers. 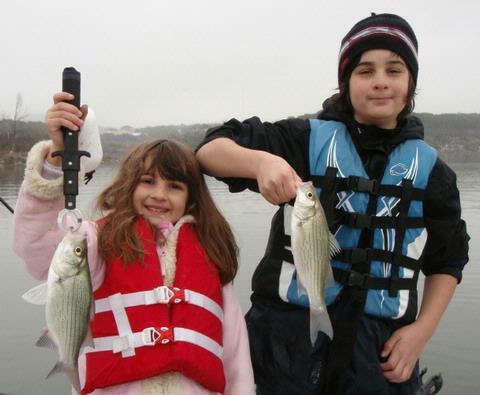 SKIFF trips are provided FREE OF CHARGE to military kids who, due to death or deployment, are without a mom or dad in their life for an extended period of time. Michael and McKensie M. of Ft. Hood were my special guests today. Michael earned big fish honors (1st and 2nd place) today with these two nice black bass. The big girl went 3.75 pounds and 18.5 inches. 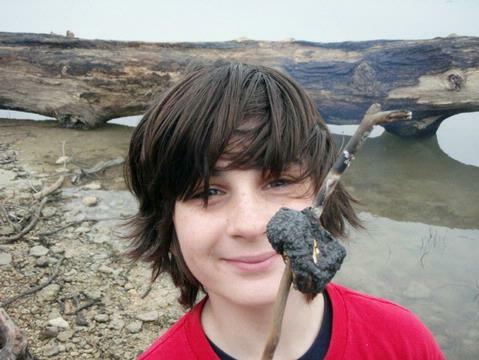 Michael DID NOT win the marshmallow roasting contest. SKIFF Trip #14 was spent on the now cool, clear waters of Stillhouse Hollow with 11 year old Michael Mitchell and his 8 year old sister, McKensie Mitchell, the children of Staff Sergeant and Mrs. Michael Mitchell. SSG Mitchell is currently stationed at Camp Casey, Korea. He was sent there, unaccompanied, just months after returning from Iraq. He serves in the Air Defense Artillery. The Mitchell’s are originally from the Marysville, CA, region near Sacramento. I picked the kids up at their home on Ft. Hood at 6:45am and we had lines in the water by 7:40am. The Lord really smiled on us today, as we found unusually active fish despite the rapidly cooling water temperatures, and despite the wet, northeast wind which typically puts the fish off. No sooner did we get on the water than we had a number of terns begin to work over schools of white bass that were forcing shad to the surface as they fed on them from beneath. We positioned ourselves at the edge of a deep flat in 23-26 feet of water after sighting fish on sonar, and began to vertical jig for these fish with slab spoons. Both kids quickly got the hang of the “rhythm” of vertical jigging, and of properly adjusting their lure depth, and the rest was history. We put 32 fish in the boat at this first stop (Area 385) including 31 white bass ranging from 7 to 12.5 inches, and one 11 inch crappie. We found that intentionally pausing the slab triggered more hits than a slab worked with more action. As the bite died off at our first spot, we ran downriggers for a bit, only coming up with one additional white bass. This approach was just a bit too fast for these fish that were less than enthusiastic given the contrary conditions. We next moved on to fish an underwater hump (Area 549). As we approached at slow speed with sonar on, the electronics just lit up to reveal an abundance of gamefish and bait on or near bottom. As I dropped my slab to bottom as a test to see how the fish were going to react, I no sooner engaged the bail to stop my lure’s decent than I was fast to a fish. As I reeled it in, I could observe other schoolmates on sonar following the hooked fish. This is a sure sign of very active, aggressive fish. I release my fish, put up my rod and reel and sat and coached the kids in using a “smoking” retrieve as they proceeded to load the boat. I was tickled to find fish this aggressive under such adverse conditions. We wound up catching exactly 34 fish at this area including 32 white bass and 2 largemouth. 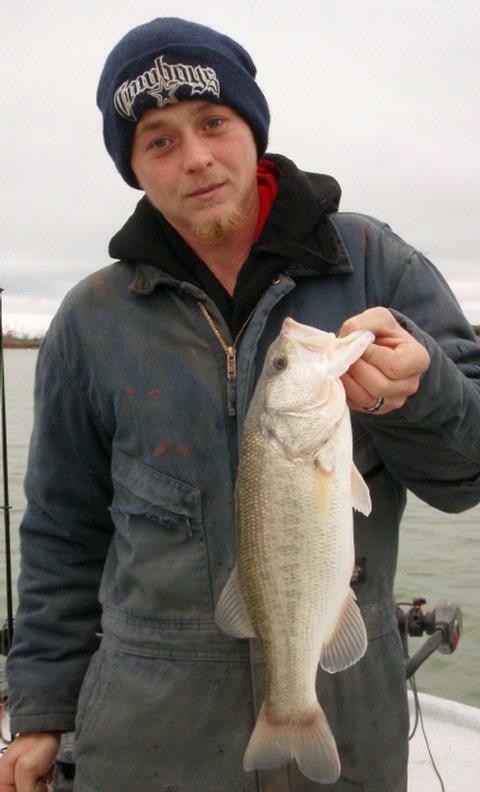 Michael caught both of these black bass, the heaviest of which went exactly 3.75 pounds and measured 18.5 inches. It was plump and no doubt had recently dined on one of the smaller white bass in this large shoal of fish we had happened upon. This day was a bit on the nasty side so far as weather was concerned. We started our trip at around 43F and temps only rose to 48F by trip’s end. After the fish had played out by around 10:45a, we hunted a nice, rocky clearing suitable for a marshmallow roast. I took the kids through the paces of building a fire starting with kindling and increasing the fuel size until we got some silver dollar sized pieces of wood burning. We went through nearly a whole bag of marshmallows, at least 10% of which were not incinerated as a result of the kids’ impatience to down some warm groceries. By 12:45 the kids were safely delivered back home. 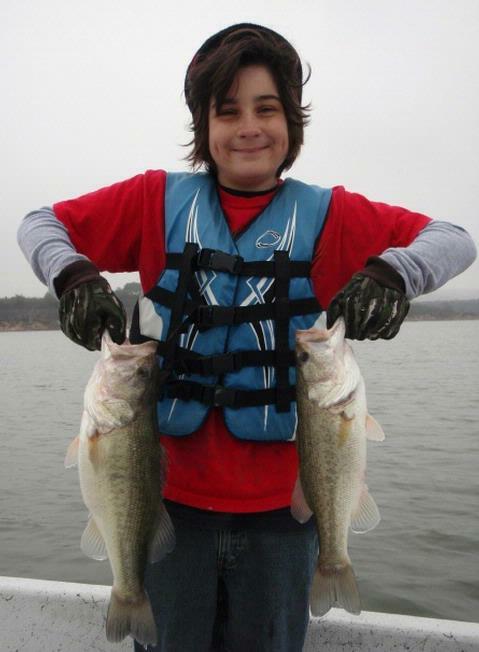 Michael’s words to his mom upon arrival, “Mom, smell my hands … they smell like a largemouth!!”. Mrs. Mitchell was duly impressed. Merry Christmas to all of you and thanks for making this happen for these kids!! I’ve been off the water for about a week and a half getting my mom moved from Kentucky down to Texas, but, I watched the Weather Channel each evening and it looks like I didn’t miss out on any good fishing conditions with the bluster and cold of late. I returned to the water today just to get back in touch with things and found the surface temps have cooled into the low 50’s. I found very willing fish today in typical cold water behaviors — congregated and reluctant to move very far. This reluctance to move is a double-edged sword. It allows you to catch a bunch of fish when you can find them, but makes location a bit more difficult. With fishes’ tendency to relate to the bottom this time of year, they can be impossible to spot on sonar unless they suspend slighly off bottom. They do this when they’re feeding, but feed for rather short periods. So, I find the best approach is to go where you think they should be, work a slab for just a few minutes as you study sonar, and then leave and keep looking if you’re not picking up fish within 5-6 minutes. 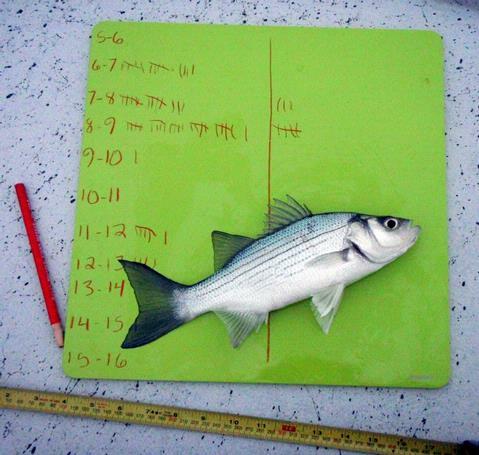 Crude though it may be, this is my fish sizing “kit” – a tape measure, grease pencil, and marking board. I’m personally studying the size/age distribution of the white bass population in Stillhouse. 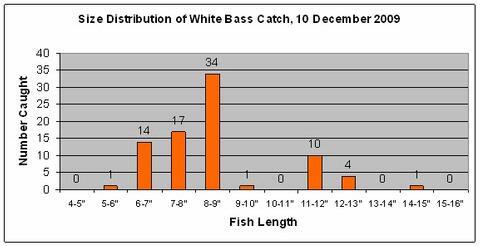 The white bass size profile for this trip (above) is very consistent for late 2009. Air Temp: 30F at trip’s start; high temp. today of only 41F. Skies: Skies were fair at sunrise, then immediately and quickly clouded up to 100% overcast and bright grey for the entire morning. I fished only 3 areas in the morning and found fish at all three. Before, during, and just after the semi-obscured sunrise I fished in the vicinity of Area 556 (BA: 4T). I found fish scattered, tight to bottom, and tight-lipped as the feeding window hadn’t really opened yet. I put two white bass in the boat here, and, after failing to observe much of promise on sonar and in the form of natural signs, I moved on. Stop #2 came in the vicinity of Area 103 (BA: 12T). Nature was waking up at this point. As I idled around I found fish tightly bunched up and on the high spots of several bottom features in this area, and holding just 6″ to 18″ off bottom, thus making them very easy to spot on sonar. The shad I saw on sonar were also tightly bunched (threatened posture) and were suspended. I dropped a slab, immediately was onto a white bass, saw schoolmates follow this hooked fish up off bottom, knew this was good stuff, and threw a buoy to mark my position. I caught exactly 48 fish here (46 white bass and 2 drum). Not a single fish would respond to a smoking retrieve or an easing retrieve. Every one was caught jigging. By 9:40a the action here was really tapering off. Typically, I’ll search deeper as the morning progresses, knowing full well after that intial hard feed, later morning action is going to pale in comparison. It was no different today. I found action at the area triangulated by Areas 551, 552, and 553 in about 34 feet of water. This was one of those circumstances where I motored in, spotted some bait in the area and just started jigging and the fish materialized from off the bottom. After I had caught a few from right off bottom, a few suspended fish started to drift through. I found I could tempt these with a slow smoking technique and tempt about 1 in 3 seen on sonar. My take here was 27 fish including 19 white bass and 8 drum. By 11:30a the fish had quit. I headed in for lunch and some honey-do’s, then returned to the water around 4:30p. Just as I got on the water I saw some perched terns rise and begin searching for an evening meal, but the did not flock to any particular area indicating a hard feed. I initially checked Area 557, found fish scattered, tight to bottom, and reluctant to hit, picking up only 2 white bass in about 20 minutes. I finished up at Area 549. There was a modest, low-light feed right at obscured sunset. I put a final 14 fish in the boat here — all white bass, and all via jigging.